← Brake-O-Rama shows you: Money for Nothin’ and Cars for free! Here are a few helpful tips to help you save at the pump………..
Having your vehicles maintenance up to date not only helps ward off larger more costly repairs down the road, it can also help relieve some of the heartache brought on by the increasing prices at the pump. Here are a few things you should keep in mind if you want to save money at the pump. These items being replaced or serviced properly can save you big down the road. 1. Is your check engine light on? If so it can be costing you 40-50% at the pump. A faulty oxygen sensor or faulty fuel injector to name just a few can dramatically reduce your engines efficiency and performance. 2. Stop in to your local Brake-O-Rama and have your engines filters checked or replaced. A clogged air filter can cost you over 10% at the pump. 3. Tuning up your engine on time ensures that your ignition and fuel systems operate at peak efficiency thus not wasting any fuel and maximizing combustion. An out of tune engine can cost you up to 25% more at the pump. Not to mention the costly repair it will inevitably lead to. 4. Keeping your tires inflated to the proper pressure believe it or not is a big deal. Ensuring proper tire pressure ( not too low or high) can improve your gas mileage by approx 5% not to mention helping your tires last longer. 5. Change your oil on time and with the proper grade oil and filter. Worn out oil has decreased viscosity. To put it simply if the oil does not lubricate parts properly that creates friction in your engine. The friction leads to increased heat, wear and lack of efficiency. Oil changes are currently on special starting at as low as $18.95 at your local Brake-O-Rama location. An oil change is the least expensive maintenance services you can have performed on your vehicle. It is however one of the most important. Neglect or procrastination can lead to the most expensive of repairs. Here are a few things you can do that will save you money at the pump without spending a penny. 1. Remove the Junk in you trunk..and the rest of your vehicle for that matter. You can save at the pump. Every 100 lbs. 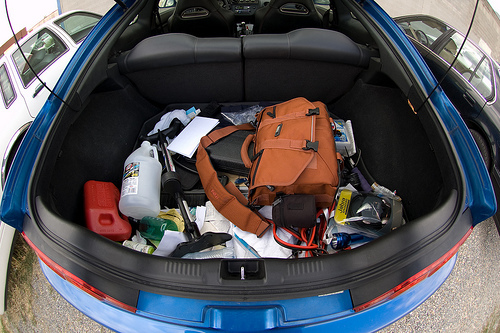 of “STUFF” in your vehicle costs you 2-3% fuel economy. 2.Avoid sitting idle. It is much more efficient to shut your car off while your waiting. You can still operate your radio etc. with the engine off. 3. Avoid aggressive driving. Not only can it be dangerous, but constant speed changes and quick uneven stops and starts waste a ton of fuel. There are speed limits for a reason. One obviously is public safety. In the 1970s during the fuel crisis, the federal speed limit was dropped from 65mph to 55mph to reduce fuel consumption. Our vehicles are most efficient between 45 and 60mph. 4. Use your cruise control. Your car will be more efficient while maintaining a steady speed. Be sure to stop in at your local Brake-O-Rama (www.Brake-O-Rama.com) to see how we can save you money at the pump.